4) Adult intestinal toxemia botulism is an even rarer form of intestinal colonization and toxin production in adults. Inhalational botulism could result from aerosolization of botulinum toxin, and iatrogenic botulism can result from injection of toxin. Clostridium botulinum, is a soil anaerobe which is common throughout the world, particularly in the west. Botulism is characterized by a symmetric descending paralysis of cranial nerves, limbs and trunk. Contamination of foodstuffs, especially vegetables, by the organism is therefore relatively common. Spores of Clostridium botulinum withstand dry heat as high as 180C for as long as 15 minutes and 100 C for hours. If proper precautions are not taken in the preservation of food, conditions favorable to germination, proliferation, and toxin production by the organisms may be established. Inadequate heating during processing, in fact, favours the growth of this organism by killing other bacteria that are less heat resistant and that cannot therefore overgrow and inhibit Clostridium botulinum. Destruction of other organisms also prevents obvious warning features of spoilage such as bad odour and color. Most cases of botulism result from the ingestion of home-processed vegetables, especially nonacid ones such as beans or corn. In some countries cases result from contamination of preserved meat such as ham and sausage (Latin botulus, "sausage"). Botulism related to commercially processed food is rare. Its epidemiology may be difficult to elicit because of the wide distribution of processed foods. Wound botulism is a rare infectious disease due to neurotoxin release from the anaerobic, spore-forming bacterium Clostridium botulinum that is becoming an ever more frequent complication of parenteral drug abuse in the Western world. It is important that emergency clinicians are aware of the possibility of wound botulism in parenteral drug users that present with unusual neurological or respiratory symptomatology. Rarely, systemic botulism follows infections of wounds by toxigenic Clostridium botulinum. The rare occurrence of botulism in infants constitutes an exception to the generalization that botulism results from ingestion or rarely absorption of preformed toxin. In infants, ingested spores of C. botulinum may germinate in the intestine and elaborate toxin, which gives rise to symptoms such as those of a hypotonic infant ("floppy baby"). 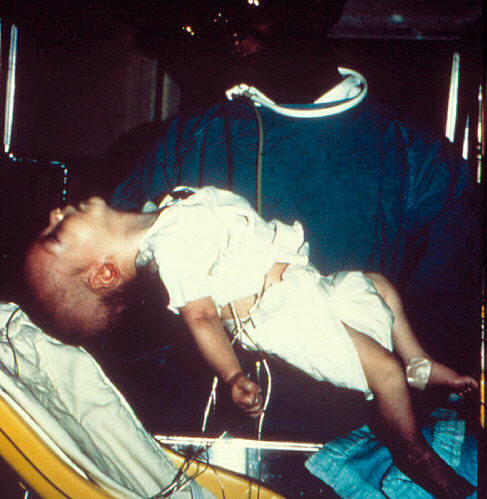 Infant botulism exceptionally has been incriminated as cause of the sudden infant death syndrome. Botulinum toxin is the most potent of all bacterial toxins. Because it resists destruction by proteolytic enzyme, it remains effective when ingested. Six types of botulinus toxin have been identified. Four are responsible for human disease. Type A , the most potent, carries a mortality of approximately 75%, and type B a mortality of approximately 20%. The promptness of onset of the symptoms depends on dose, usually beginning between 12 to 36 hours after ingestion, rarely as little as 3 to 4 hours. Nausea and vomiting, sometimes with a sense of abdominal distress but no real pain, are observed early. Diplopia and difficulty in swallowing are usually the first features of the characteristic paralyses produced by the toxin. Paralyses of pharyngeal muscles leads to regurgitation of ingested food and liquids through the nose. This often causes aspiration pneumonia. The patient may be unable to hold the head erect because of involvement of the neck muscles. Death, if it occurs, usually results from respiratory failure. Specific antitoxin is the only therapeutic measure available and is of value only early. The toxin is bound to neural tissues once the disease becomes established and in those sites can no longer be neutralized by specific antitoxin. Botulinum toxin acts something like curare, affecting principally the end plates of nerves and specifically the myoneural junctions of the motor apparatus. The toxin binds to membrane receptors of the the synaptic vesicles and inhibits release of acetylcholine, thus causing paralysis and respiratory failure. No morphologic changes occur that are specific for botulism. There may be petechiae and ecchymoses on serous surfaces and the in central nervous system as secondary effects of anoxia. There may be minute thromboses of small vessels, primarily in the brain and brain stem. The specific diagnosis depends on the demonstration of an antitoxin-neutralizable paralysis in rodents injected with the suspected food material or even with a sample of the patients blood. Treatment: The mainstays of therapy are meticulous intensive care (including mechanical ventilation, when necessary) and timely treatment with antitoxin. Botulism is both an old and an emerging disease. Over 100 years ago, the classic food-borne type was found to be caused by ingesting contaminated food containing the toxin produced by a bacteria. In the first half of the 20th century a second form, wound botulism, was discovered. Three additional forms (infant, hidden, and inadvertent) were first described in the last quarter of the 20th century. Our understanding of how botulinum toxin blocks the release of acetylcholine at the neuromuscular junction has been clarified in the past 10 years. In the past 20 years, we have witnessed one of the strangest of all ironies in the history of medicine. The very lethal botulinum toxin is now being used as a treatment in an expanding list of disorders. Research is advancing in several directions. These new avenues include improved methods of preventing and treating botulism and additional novel uses of botulinum toxin as a therapeutic agent. Extraction and inhibition of enzymatic activity of Botulinum neurotoxins/B1, /B2, /B3, /B4, and /B5 by a panel of monoclonal anti-BoNT/B antibodies. A Decade of Spore-Forming Bacterial Infections Among European Injecting Drug Users: Pronounced Regional Variation. [Cosmetic facial surgery. The application of botulinum neurotoxin type A]. Botulinum neurotoxins and botulism: a novel therapeutic approach. Variant angina in the setting of food-borne botulism. Wound botulism acquired in the Amazonian rain forest of Ecuador. Botulism as a cause of respiratory failure in injecting drug users. Foodborne botulism in a six-month-old infant caused by home-canned baby food. Clinical and epidemiological characteristics of botulism in France. Type B botulism: a family outbreak. Wound botulism in a patient with a tooth abscess: case report and review.